The rain this early morning prevented many voters from coming out to vote in the Lagos council polls in Eredo and Ikotun/Igando Local Council Development Areas. 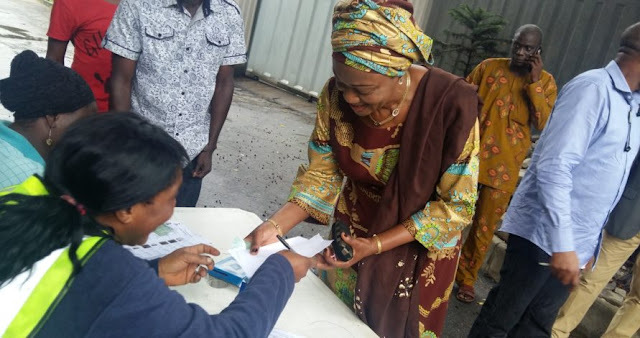 Correspondents of the News Agency of Nigeria (NAN), who monitored the election, report that there was a low turnout of voters at some polling units. NAN also observed that there was no presence of security personnel at Ward A Units 2, 7, 8, 10, 16, 18 and 19 in Ilara community as at 9.30 a.m. However, security men mounted a barricade at the main junction as the Police engaged in stop and search. An electoral officer in the area attributed the low turnout to the rain, adding that voters may still come out as soon as the rain subsided. At Ward 037 in Ikotun/Igando LCDA, a few voters, majority of them old people, were at many of the polling units. Mrs Yemisi Dosunmu, a 57-year- old caterer, told NAN that the apathy by youths was not good for our democracy. She said it was important for the younger generation to understand the importance of voting. “I came all the way from Egbe to vote here because this is where I registered when I was living here. “That is to show you how important this election is to me; our voting age children (youths) need to understand that they have the power to elect leaders of their choice. “As citizens, it is an obligation and our vote is the only power we have against bad governance, the power lies with us; we need to educate our youths,’’ she said. Also, a 43-year-old engineer, Dauda Ojo, told NAN that the poor turnout showed that people lacked the understanding of their voting power. “Since I started voting, this turnout is one of the poorest, we cannot achieve much if we keep showing apathy towards the election of office holders,’’ he said. NAN also reports that some food vendors at Eredo LCDA took advantage of their proximity to the polling units to make brisk business. credible in spite of the initial low turnout of voters due to the rainfall. At polling booth no Ward E19 on Oluwole Olaniyan Street, Orile Agege, where the Speaker of the Lagos State House of Assembly, Rt. Hon Mudashiru Obasa, will vote, LASIEC officials were nowhere in sight as at 11:20am. Our reporter, Joe Agbro reports that Police personnel and party agents were however on ground waiting, while residents went about their business. Youths in the area played football on the empty streets. Large turn out of voters at polling unit 025, (Hausa Community in Obalende). Governor Akinwunmi Ambode voted at 9.31 in Ward A6 Unit33 at Ogunmodede College in Epe Local Government. center. He urged voters to defy the early morning to vote in the election. As at 10 am accreditation of voters has not commenced at most polling units in Ikoyi. According to report, there was mix up in the distribution of electoral materials. Voting materials meant for different polling units were taken to other venues. Officials of the state Electoral Commission are trying to redistribute the materials. The rain kept electorates for the local government election in Lagos away from the polling booths. The turnout to the polling units visited was very low.